(Nanowerk News) In the quest to harvest light for electronics, the focal point is the moment when photons—light particles—encounter electrons, those negatively-charged subatomic particles that form the basis of our modern electronic lives. If conditions are right when electrons and photons meet, an exchange of energy can occur. Maximizing that transfer of energy is the key to making efficient light-captured energetics possible. "This is the ideal, but finding high efficiency is very difficult," said University of Washington physics doctoral student Sanfeng Wu. "Researchers have been looking for materials that will let them do this—one way is to make each absorbed photon transfer all of its energy to many electrons, instead of just one electron in traditional devices." In traditional light-harvesting methods, energy from one photon only excites one electron or none depending on the absorber's energy gap, transferring just a small portion of light energy into electricity. The remaining energy is lost as heat. But in a paper released May 13 in Science Advances ("Multiple hot-carrier collection in photo-excited graphene Moiré superlattices"), Wu, UW associate professor Xiaodong Xu and colleagues at four other institutions describe one promising approach to coax photons into stimulating multiple electrons. Their method exploits some surprising quantum-level interactions to give one photon multiple potential electron partners. Wu and Xu, who has appointments in the UW's Department of Materials Science & Engineering and the Department of Physics, made this surprising discovery using graphene. "Graphene is a substance with many exciting properties," said Wu, the paper's lead author. "For our purposes, it shows a very efficient interaction with light." Graphene is a two-dimensional hexagonal lattice of carbon atoms bonded to one another, and electrons are able to move easily within graphene. The researchers took a single layer of graphene—just one sheet of carbon atoms thick—and sandwiched it between two thin layers of a material called boron-nitride. "Boron-nitride has a lattice structure that is very similar to graphene, but has very different chemical properties," said Wu. "Electrons do not flow easily within boron-nitride; it essentially acts as an insulator." Xu and Wu discovered that when the graphene layer's lattice is aligned with the layers of boron-nitride, a type of "superlattice" is created with properties allowing efficient optoelectronics that researchers had sought. These properties rely on quantum mechanics, the occasionally baffling rules that govern interactions between all known particles of matter. Wu and Xu detected unique quantum regions within the superlattice known as Van Hove singularities. "These are regions of huge electron density of states, and they were not accessed in either the graphene or boron-nitride alone," said Wu. "We only created these high electron density regions in an accessible way when both layers were aligned together." When Xu and Wu directed energetic photons toward the superlattice, they discovered that those Van Hove singularities were sites where one energized photon could transfer its energy to multiple electrons that are subsequently collected by electrodes—not just one electron or none with the remaining energy lost as heat. By a conservative estimate, Xu and Wu report that within this superlattice one photon could "kick" as many as five electrons to flow as current. With the discovery of collecting multiple electrons upon the absorption of one photon, researchers may be able to create highly efficient devices that could harvest light with a large energy profit. Future work would need to uncover how to organize the excited electrons into electrical current for optimizing the energy-converting efficiency and remove some of the more cumbersome properties of their superlattice, such as the need for a magnetic field. But they believe this efficient process between photons and electrons represents major progress. 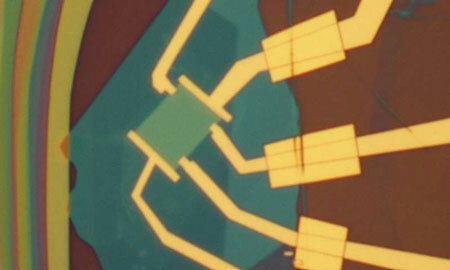 "Graphene is a tiger with great potential for optoelectronics, but locked in a cage," said Wu. "The singularities in this superlattice are a key to unlocking that cage and releasing graphene's potential for light harvesting application."